These show rabbit pictures were taken at The West Puget Sound Rabbit and Cavy Club during their ARBA-sanctioned rabbit and cavy show in September of 2009. We hope you'll enjoy these pictures taken throughout the show. 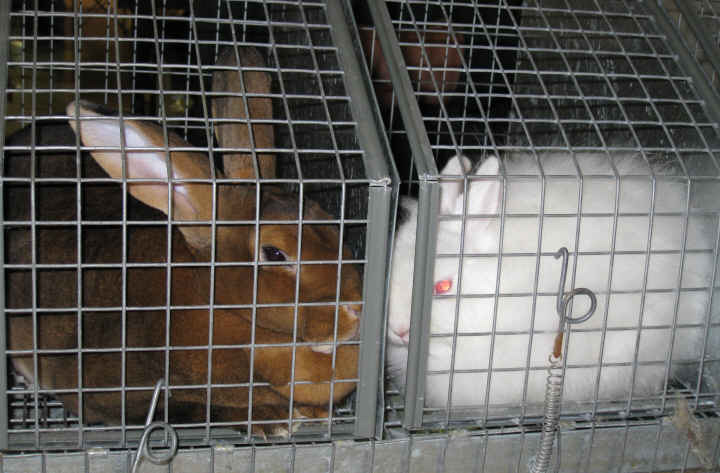 We'll walk you through the process of showing rabbits with these show rabbit pictures. Maybe one day we'll meet you at a rabbit show! 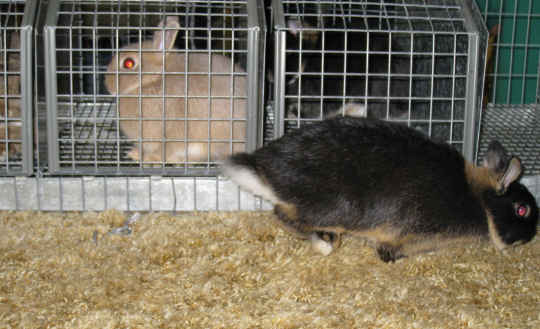 The many exhibitors show up bright and early to the rabbit show with carrying cages full of their rabbit entries. 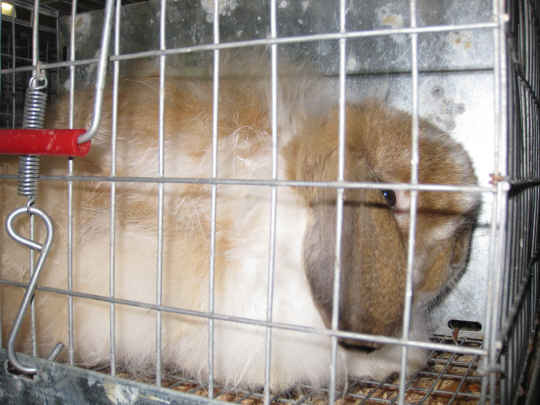 Here's a fuzzy lop waiting patiently in his carrying cage. 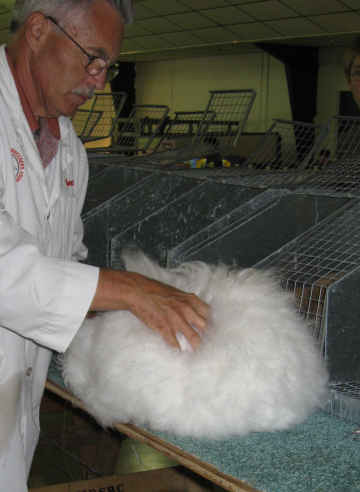 Rabbit shows require the dedicated assistance of plenty of hard-working people. 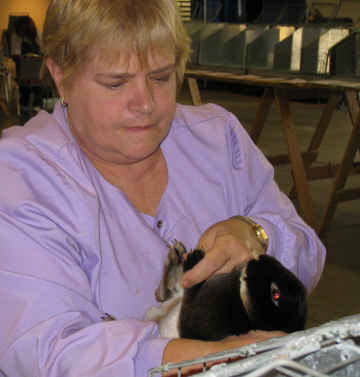 Here's Barbara, the show secretary, preparing comment cards for every rabbit. 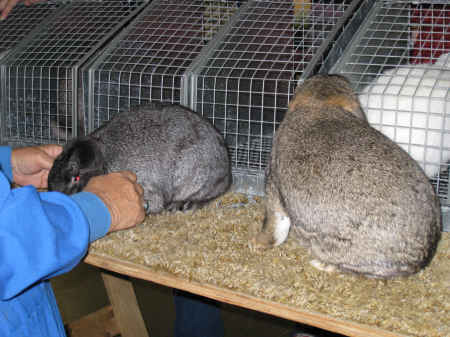 As the show starts, the show superintendent calls up the various rabbit breeds and varieties, one by one. 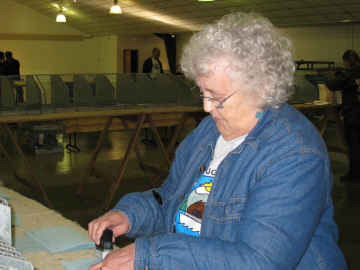 As the judge finishes judging one breed variety, another variety is called to the show tables. 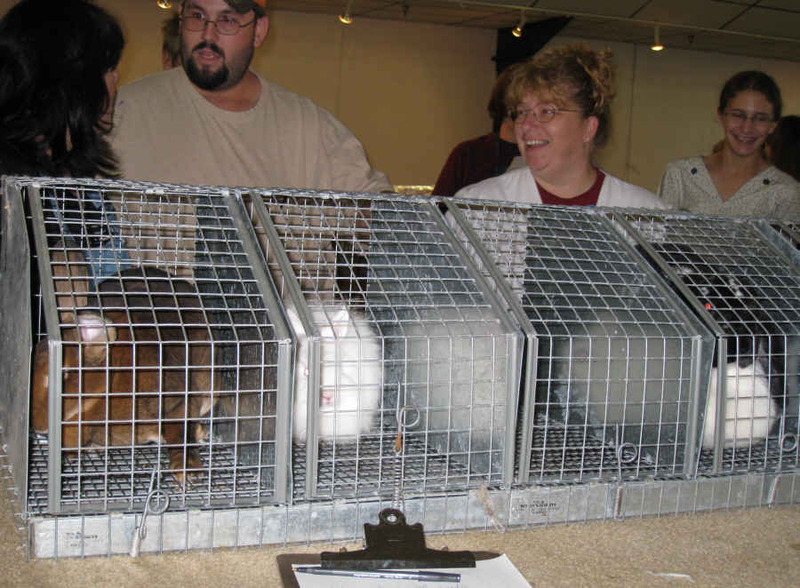 At most shows, the rabbit breeders and owners bring their own animals to the show table, and place them into a small holding cage. The judge checks out every rabbit in a class. The Rex breed groups each variety into 4 classes: senior and junior bucks, and senior and junior does, for every color variety. For example, Castor Rex senior bucks would be one class. 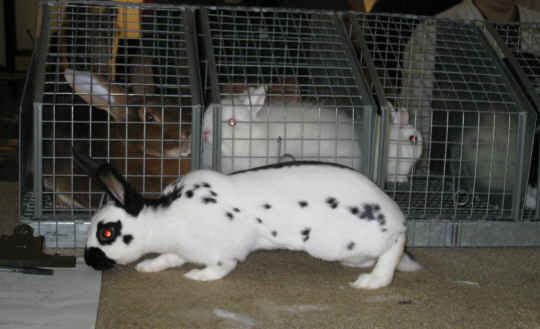 All the castor rex rabbits together make up a variety of rex rabbits, and Rex is the name of the breed. In this picture, the judge is checking that all the toenails are the correct color as called for in the Standard of Perfection. 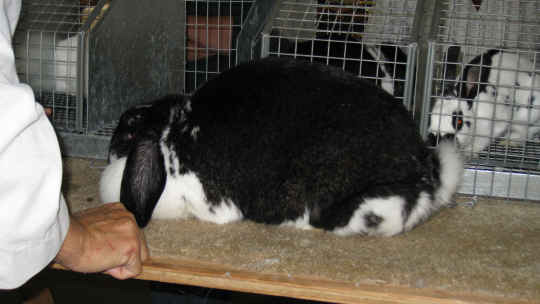 In this show rabbit picture, the judge uses a ruler to measure the length of this English Lop's ears from tip to tip. The Standard requires a minimum of 21 inches, and also specifies the width of the ears, which the judge will measure as well. 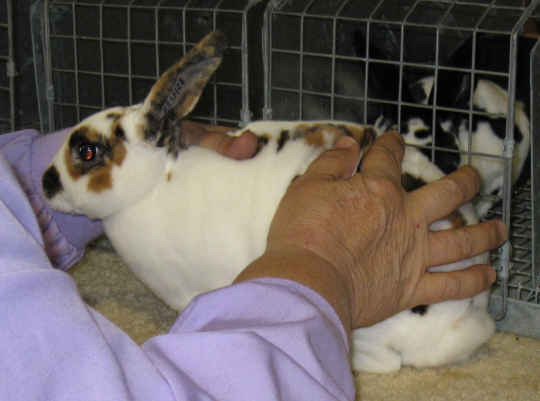 Judge is comparing heads and ear placement on two mini-lop rabbits. 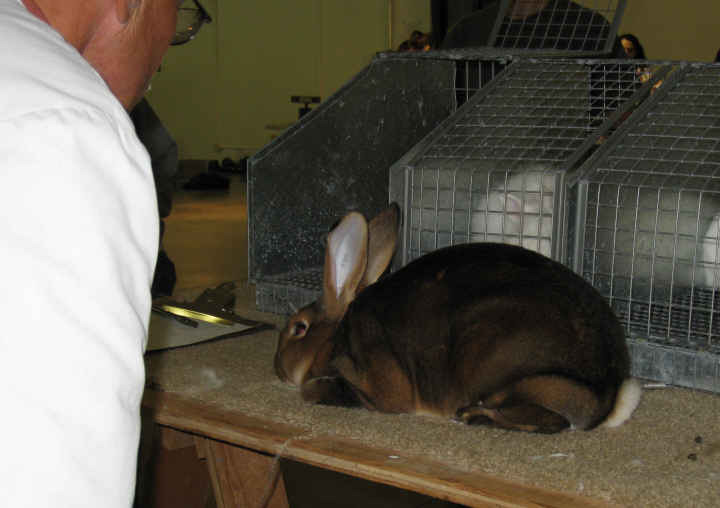 This show rabbit picture shows the judge checking the fur density of a broken (spotted) tri-colored mini-rex rabbit. 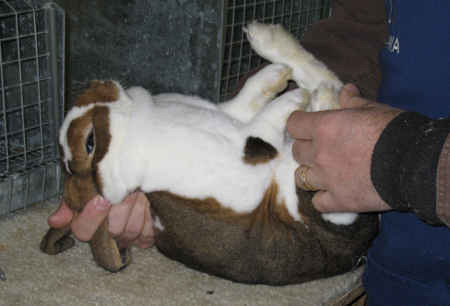 English Spot rabbits are judged in motion, rather than crouched and still. 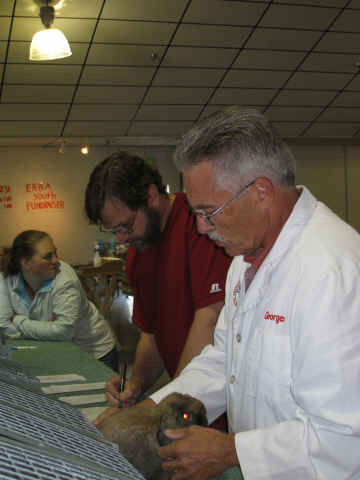 Judges turn the rabbits over carefully and check the teeth of the rabbit and whether the rabbit is male or female. 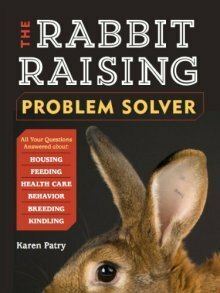 This rabbit is a broken castor rex rabbit. This black otter Netherland Dwarf is stretching his legs. Here is the Best of Breed Rex Rabbit and the Best of Breed Jersey Wooly Rabbit waiting their turn for the judge to evaluate them for a Best In Show award. 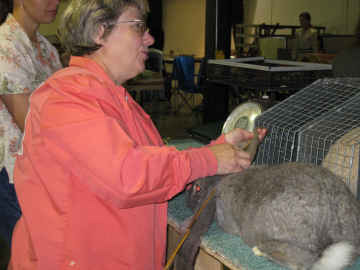 Judge is evaluating the Best of Breed Broken Black French Lop rabbit and the Best of Breed English Angora Rabbit. Yes, it is sometimes hard to tell which end is coming and which is going...! It is not easy to win the coveted Best In Show! Congratulations to you if any of your show rabbits have achieved this honor!